Krishna Anujan, Zoya Tyabji, Sowjanya Chandrasekhar, Vardhan Patankar and Chetana B Purushotham conducted a very successful birding workshop in the Andaman Islands with the aim to train and help local bird enthusiasts develop as birding tour guides in the islands. Here is their description of what they did, with some advice at the end for others who wish to conduct such workshops. It was a typical June day in Port Blair – cloudy, unpredictable, and beautiful. Somewhere in town, 25-odd people were intently watching a couple of glossy swiftlets soaring, unperturbed by the bad weather. These people were a collection of bird photographers, zoology students, doctors, tour operators, trekking guides and even a few forest guards, who had all come together to be students again, for five days. 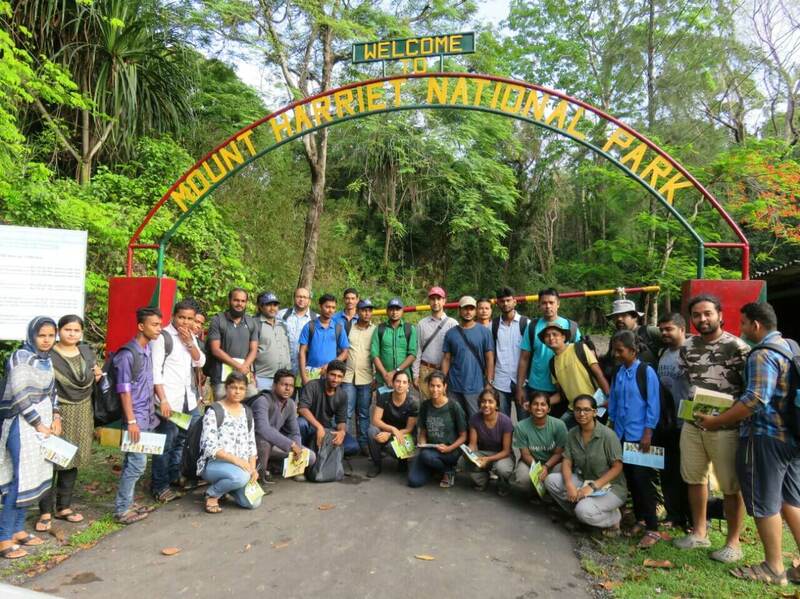 The Forest and Tourism Departments, Andaman and Nicobar Islands had organised a birding workshop to train and certify local islanders as birding tour guides. 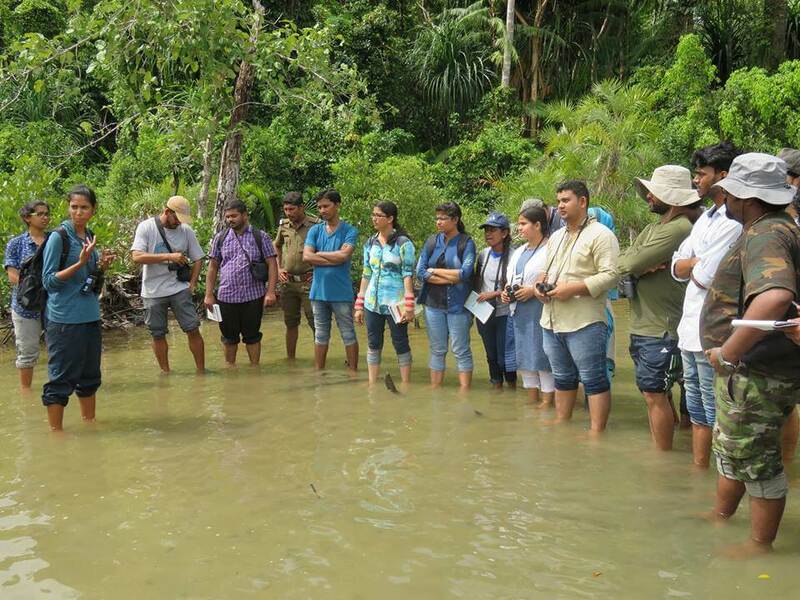 To conduct this workshop, five of us researchers, loosely associated with the Andaman and Nicobar Islands Environmental Team (ANET) put our heads together to come up with a plan. Over the five days of the workshop (31 May to 4 June 2016), we held sessions that covered bird diversity, endemic species, natural history and behaviour. Throughout the workshop, we practised techniques (and tricks) to identify birds by looking at their shapes and patterns, habits and habitats and by listening to their sounds. We emphasised the need to record observations by making notes, sketches and lists. Entire sessions were dedicated to learning how to count birds, use field guides and share lists on eBird. We had a lot of fun during bird quick-draw quizzes, a parliamentary-style debate around birdwatching ethics and finally birding-guide trial runs where roles were reversed! It turned out to be a good balance of classroom and field time when we birded in different ecosystems: forest edge and fields, evergreen forests, littoral forests, mangroves and beaches. At the end of five days, everyone had caught up to the same level; what had started out with a photo quiz where few answered, ended with a bird pictionary where everyone was drawing and shouting answers! The entire group has now organised into a birding society that takes a trip every other weekend and shares birding updates through social media. Many have been actively contributing to eBird since, and their reach across these islands, where birding is still a new hobby, can be phenomenal. Starting the workshop with a lesson plan and schedule, but being open to constant modifications as you get to know your participants, helps to accommodate their strengths and weaknesses. 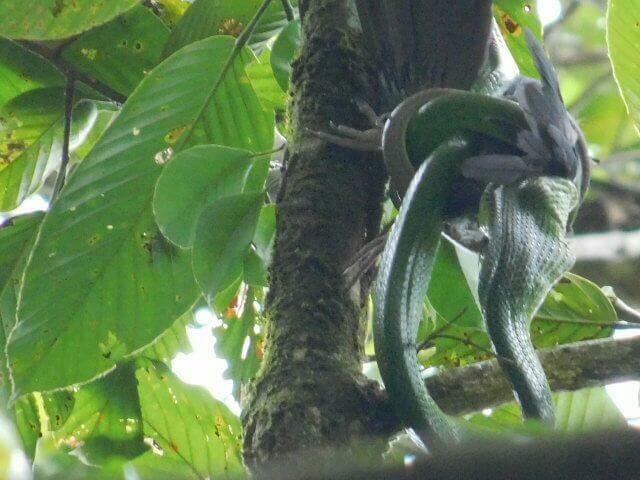 The biological and technical aspects of bird watching can be taught in local languages. Our methods of teaching (inspired by the SCUBA diving way of learning!) ensured that sessions began with a clear briefing and ended with a critical debriefing session with the students. While planning the workshop, ‘instructor’ notes helped us immensely to keep track of the main messages needed to be conveyed in each session. Adults enjoy interactive games too! Post-session evaluations help students recap their learnings especially when done using interactive (and often impromptu) games. Constantly mix the students (using birding-based games again) for the different sessions (even if you sense reluctance at first) and you might find that you’ve helped create a mixed group, flocking together even months after the workshop. Really wonderful experience in the workshop. Learn lots about birding. Actually I was looking for birding training from last 10 years but nobody was there to guide. It’s dream come true. Thanks to forest Dept., tourism Dept. And ANET.